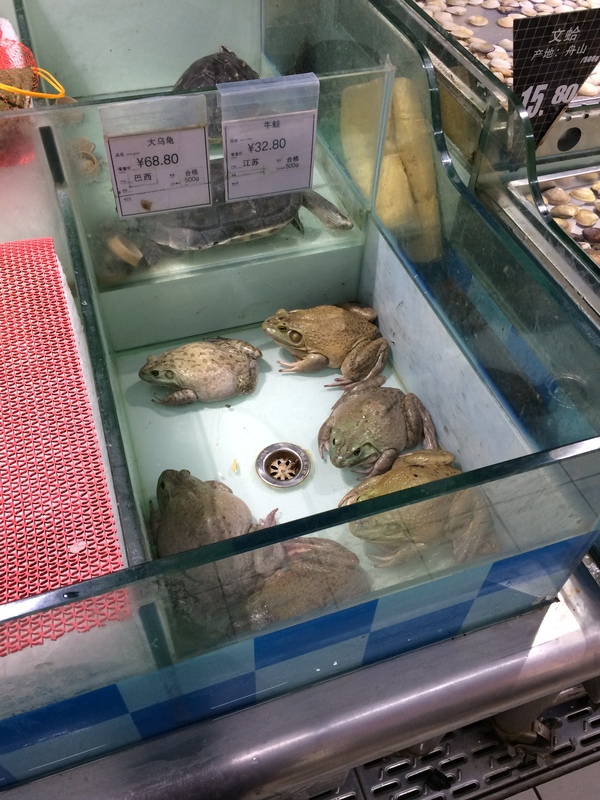 Ok, so the big one that I got from many people before leaving was commenting about how the Chinese eat dog…or cat…or any other number of “weird” foods. First of all, assuming that any food people eat is “weird” is a little insensitive—because if we’re being honest, making a pastry in a lab, filled with chemicals, pumped full of preservatives so it can stay on the shelf for years, and then deep-frying it? Uhh…Americans eat some “weird” stuff too, so my mindset is live and let live—and I’ll still eat what I like. 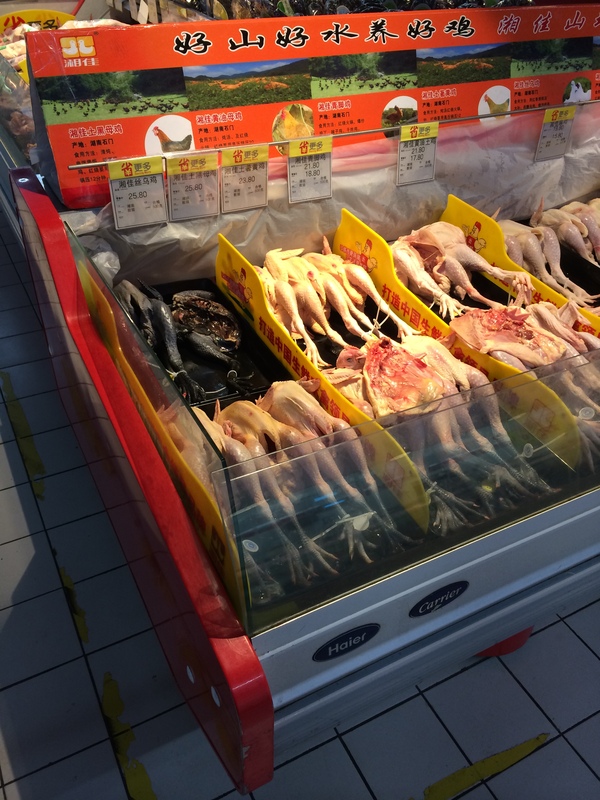 As for meats, I have seen a huge variety—but no dog or cat. 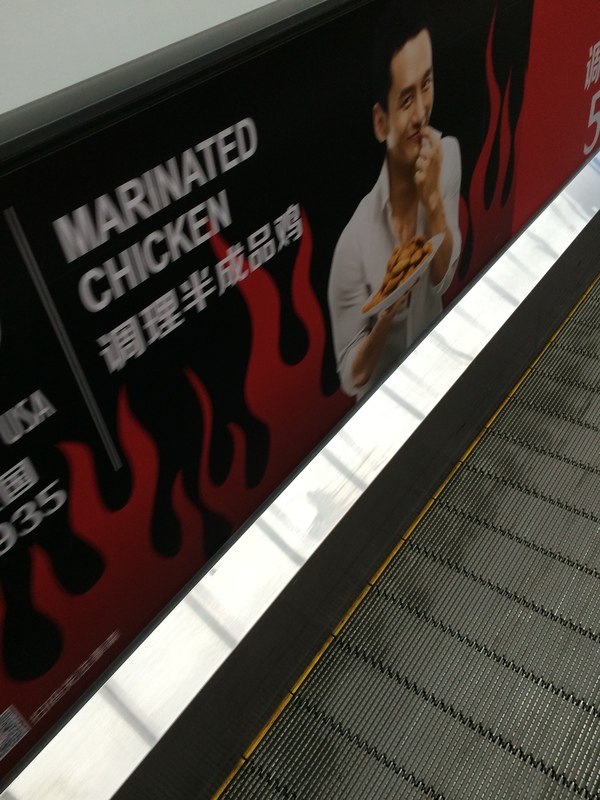 I have heard that sometimes there can be “counterfeit meat”, meaning that a restaurant says it’s chicken but it’s really something else. I have not encountered this (that I know of) and honestly, it’s not my biggest concern right now. I DO see a ton of seafood—especially squid, octopus, shrimp (delightfully, British-ly called prawns here), fish—as well as chicken, pork, and steak (or other variations of cow meat). Tofu is also in great supply—which is nice when I don’t feel like being risky with the meat. Ahh, there I go on a tangent again. Back to food in Shanghai. There are, as well all know, two types of food to experience in any city—local restaurant cuisine, and the grocery store. 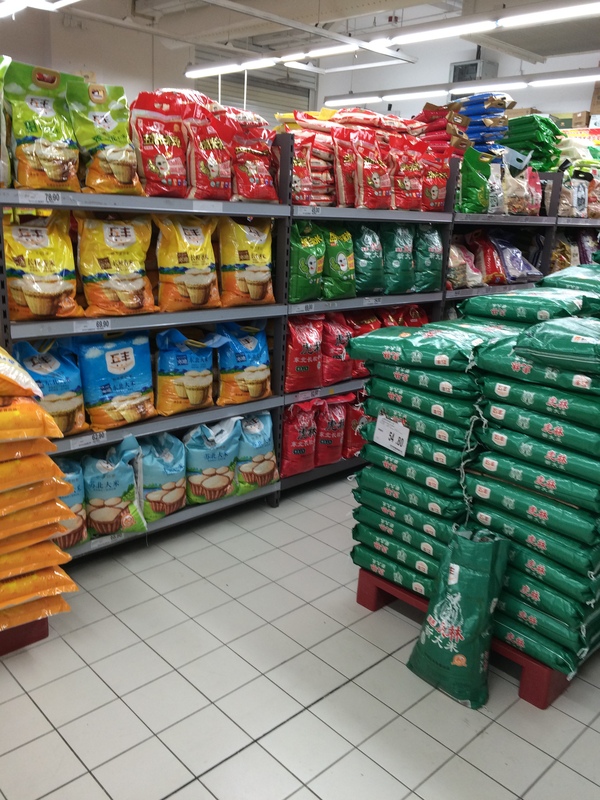 I begin first with the dining out experience, and then will give you a little walk through some of the supermarkets that I’ve been to. Most of the restaurants I’ve been to here in Shanghai have been fantastic. Typically, everything is family style and sharing plates, which I think is the best way to eat. It allows for much more variety during meals, and (so far) has lead to many lively conversations about which dish is best. Plus, for those familiar with Friends, I share a similar sentiment to Joey in that “JOEY DOESN’T SHARE FOOD”. I dislike sharing when I’ve ordered my own meal—but when it’s a meal meant to be shared, game on! Me when I order my own meal. The top meal I’ve had thus far was back at the beginning of my move here. In the trendier, downtown area of Shanghai is a place called Szechuan Citizen. I may have already mentioned this place but it was Just. That. Good. We ate the best ribs I think I’ve ever had in my life, huge (maybe 8-9 inch pieces) with the meat falling off the bone and unbelievable spices. I, being a life-long shrimp fan, also had the best shrimp I’ve ever had. They were marinated in a red tomato-y sauce and were so tender and juicy by the time we ate them, they barely had to be chewed. Plus the entire meal, including many drinks, cost each of us about 300 rmb (~$50). There are also many excellent Western restaurants—I’ve had several good burgers and gone to a couple of great Mexican places—which makes me grateful to live in such a large city. I am certainly eager to continue to learn about local food, but it’s nice to have something familiar when I want. Additionally, Asian cuisine in general—from Japanese food and sushi, to Vietnamese, Thai, Korean, and all the different cuisines of China—is plentiful here. Going to the grocery store has always required a bit of thinking on my part. I rarely make lists and I never remember what I need, so I frequently wander the aisles, picking items at random (on another note, we may have located the root cause of why I don’t eat healthier meals…). 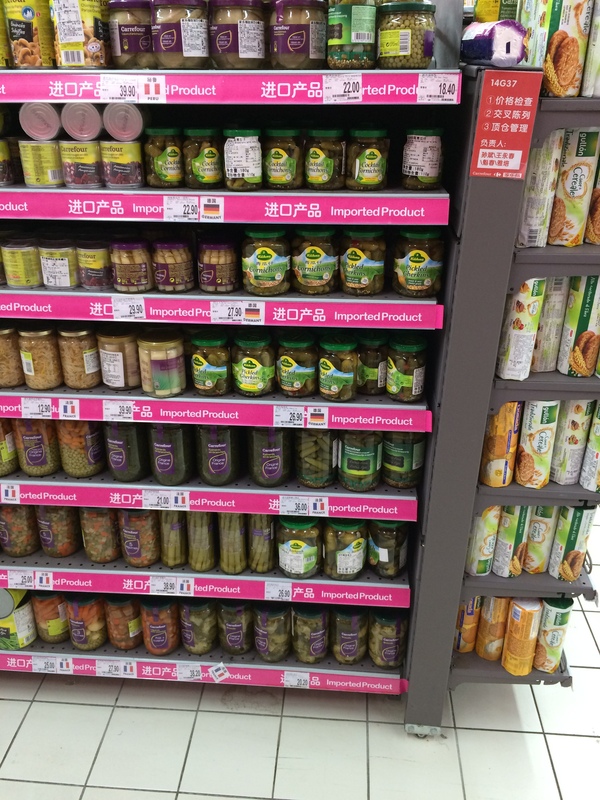 When you couple that experience with living in a foreign country, where products are typically only labeled in Chinese, and you have no idea what some items that you’re looking at ARE, it’s a task and a half. 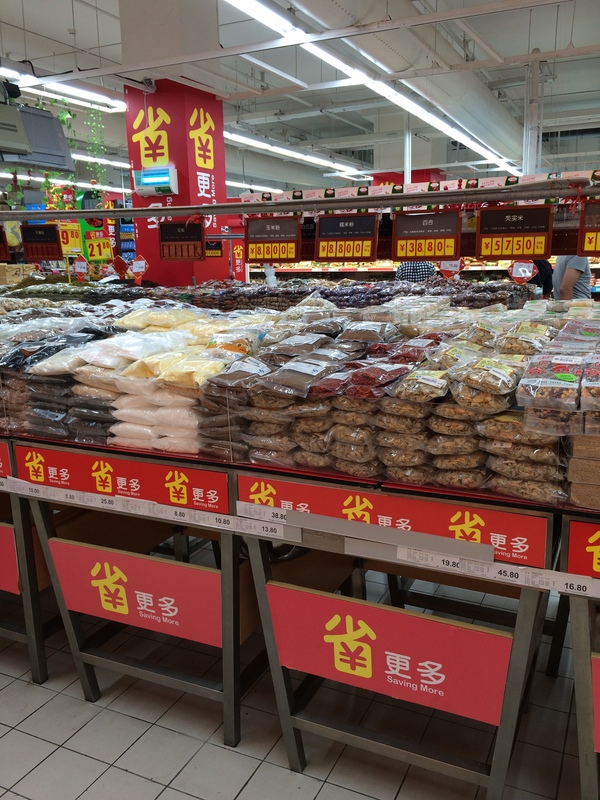 First, there are a variety of food store locations—large shops like Wal-Mart and Carrefour, smaller markets, and then even smaller places that simply sell meat or fruits and veggies. 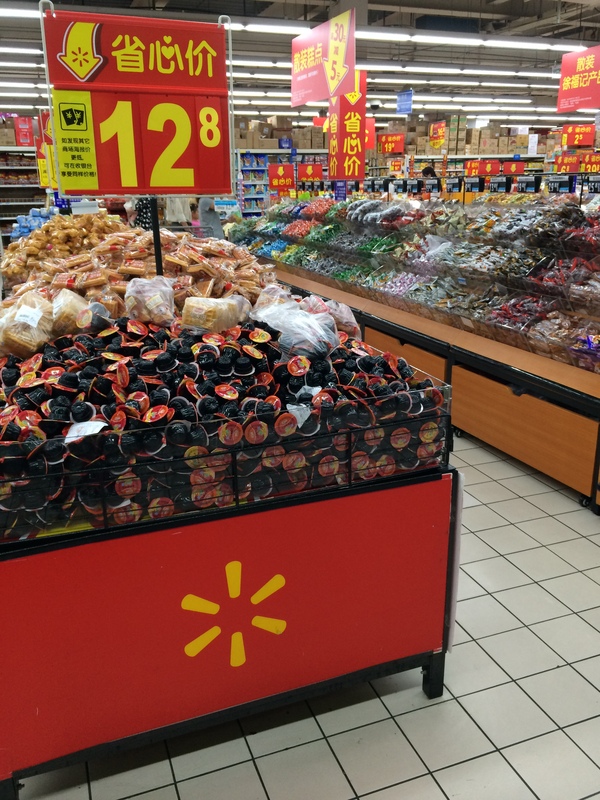 The “one stop shop” doesn’t exactly exist here and I sometimes have to visit multiple stores to get everything I want—though Carrefour and Wal-Mart get pretty close. Disclaimer: Wal-Mark here is not the Wal-Mart of the U.S. I can’t even entirely explain why, it’s just really different. Basically the only similarity is the logo and a few products. I did not buy the pickles, but my intense desire to do so was intriguing. I suppose it’s because they don’t come with every meal here like they do in the US. Also, small side note, I feel like such a creep taking pictures of ordinary things like the grocery store. You would think I’d feel cool and stealthy, like a spy or something. 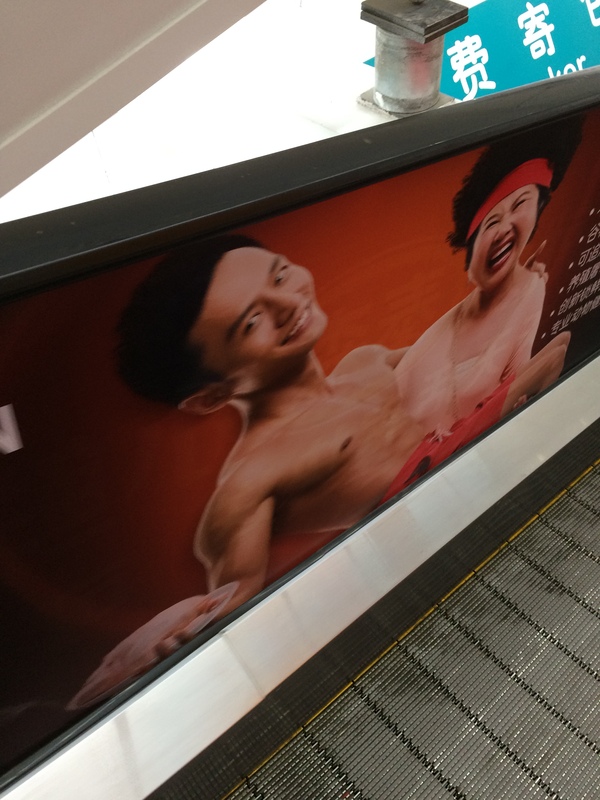 Nope, just creepy. The meats and seafood section of the grocery store is also quite different. 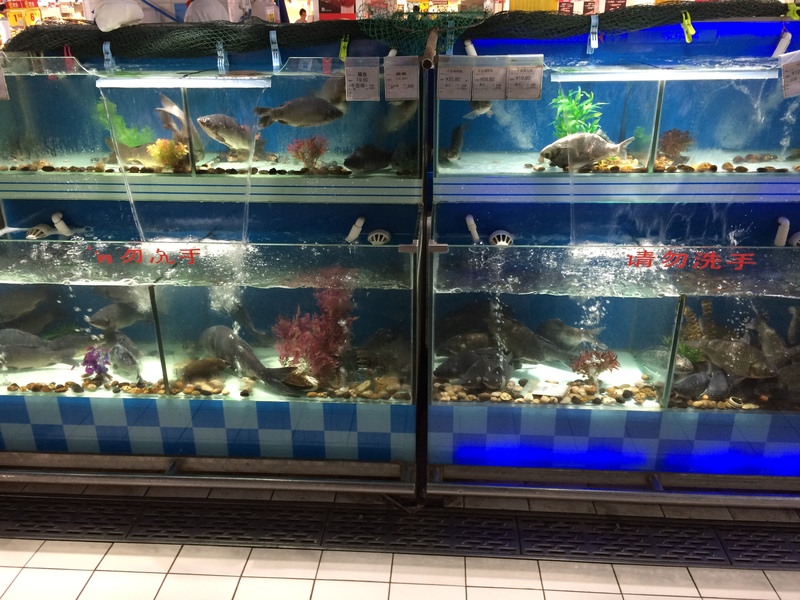 The seafood section looks more like a pet store in my eyes because everything is alive—fish, crabs, frogs, octopi, etc. None of the meat or seafood is wrapped in anything and the butcher does not wear gloves while cutting it, which also struck me as vastly different from the US—where the meat is honestly not necessarily healthier/less prone to microbes just because it’s in plastic. 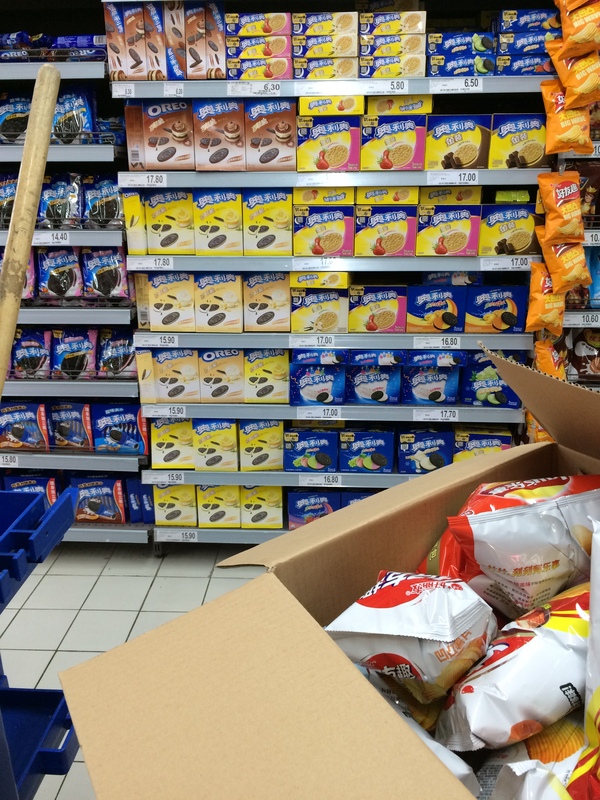 Carrefour has a particularly large selection of baked goods and sweets. The thing I’ve noticed about many foods here—both sweets and other snacks—is that they don’t seem to be as saturated with ingredients as in the US. For example, sweets don’t taste as sugary, and savory snacks are not as salty. 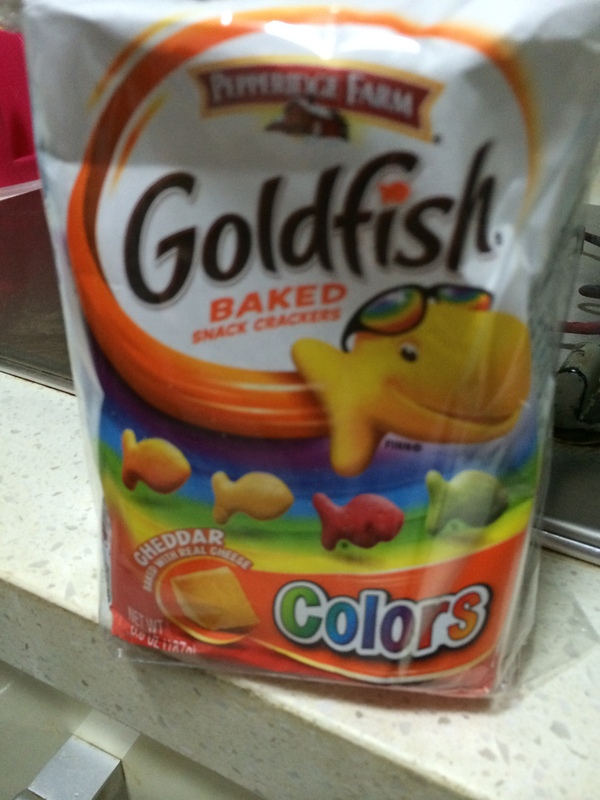 It’s actually kind of nice and my tongue and stomach are happier not being overloaded with flavors. 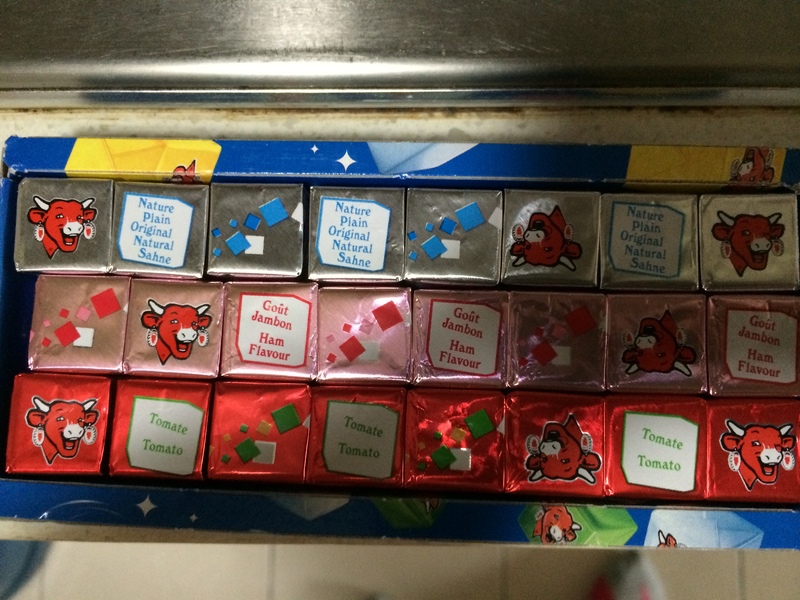 There are “familiar” products that come in different and intriguing flavors. 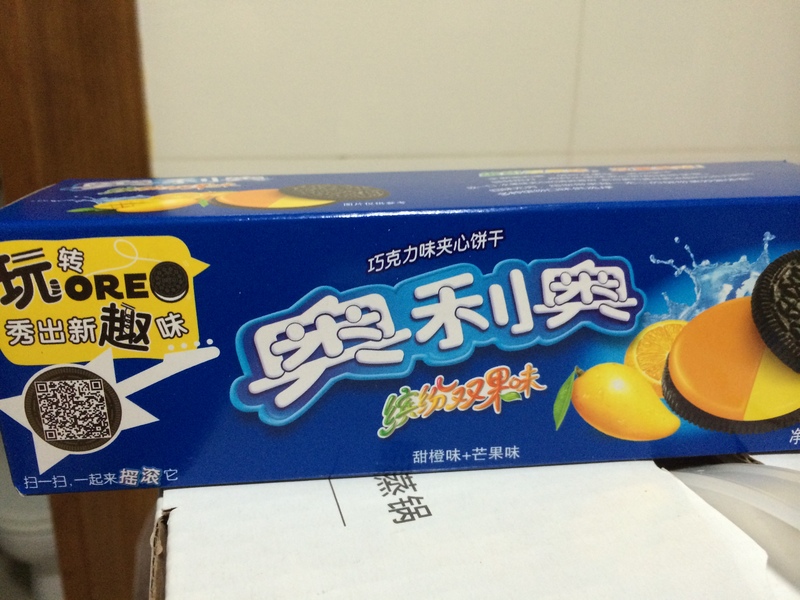 For example, these orange mango Oreos—which I bought, and they taste like those chocolate oranges they sell around Christmastime. In fact, Oreos seem to be incredibly popular here. I frequently see huge shelves full of them, as well as other Oreo products (like cookie bars and other variations on the original). 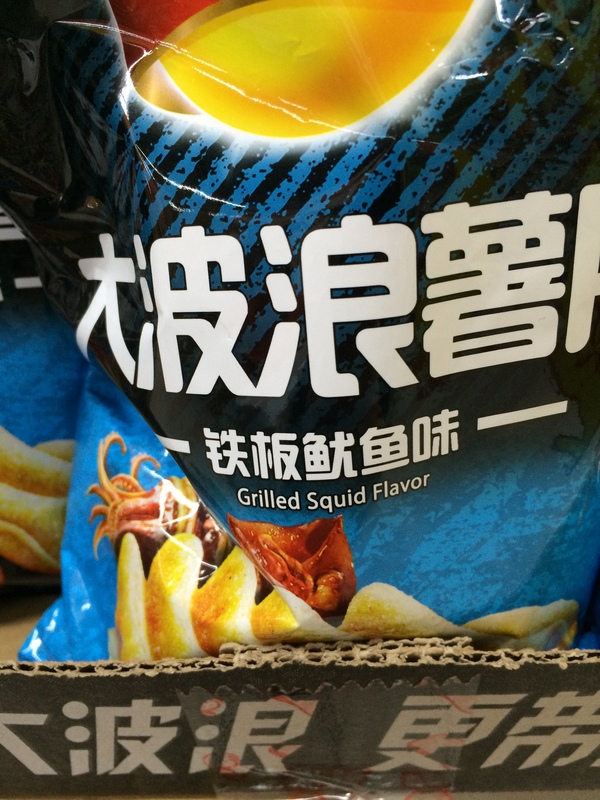 There are also many intriguing varieties of potato chips, such as chicken and rib flavors, and even these squid chips—which I have not bought and don’t know if I’m brave enough to try yet. My absolute favorite new chip is the BBQ Doritos a coworker introduced me to. Not sure if they exist in the US, but they should. 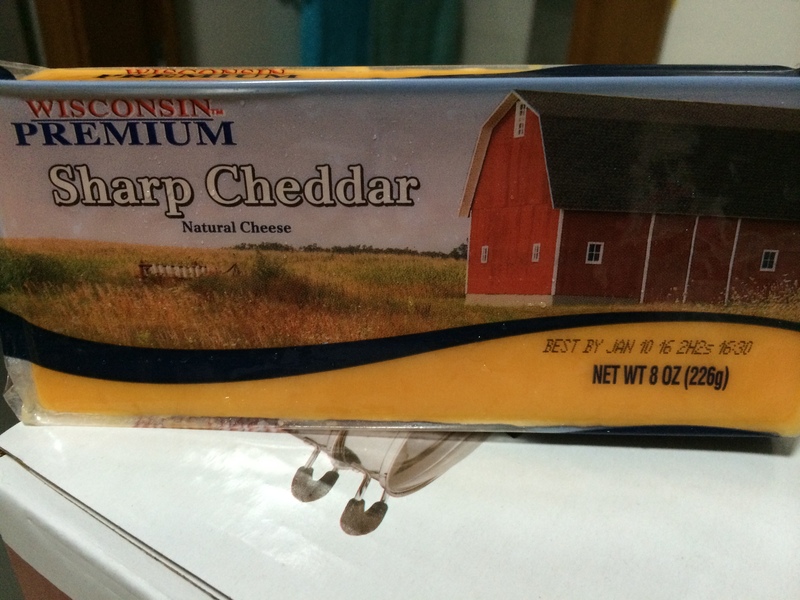 I did get my hand on those delicious Laughing Cow cheese cubes (which I haven’t seen since elementary school and came in ham and tomato flavors as well as plain) and some Wisconsin cheddar, as well as some Goldfish. All of these things cost me far more than Chinese products but it was nice to have something familiar. 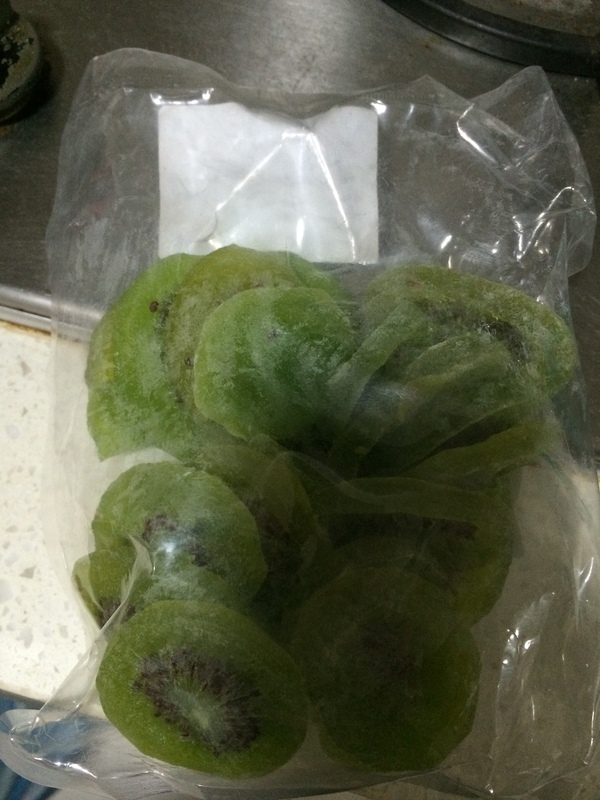 Dried fruits are plentiful here and I particularly like these dried kiwi slices. 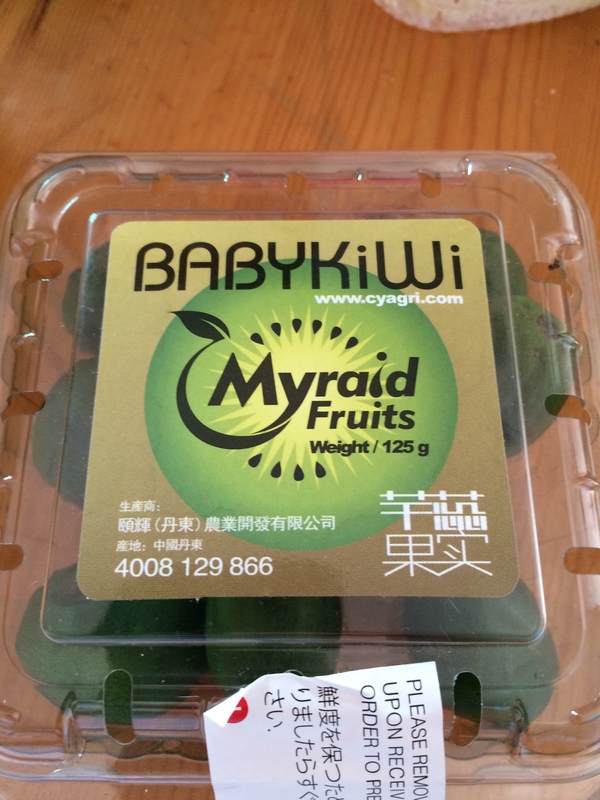 You can also find kiwi berries—which are THE GREATEST THING EVER. 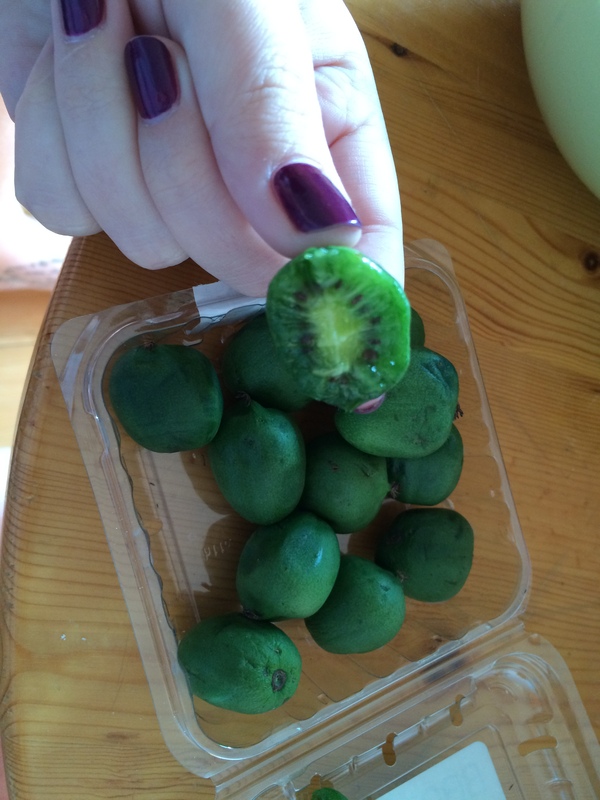 They’re like mini skinless kiwis you can just pop in your mouth! 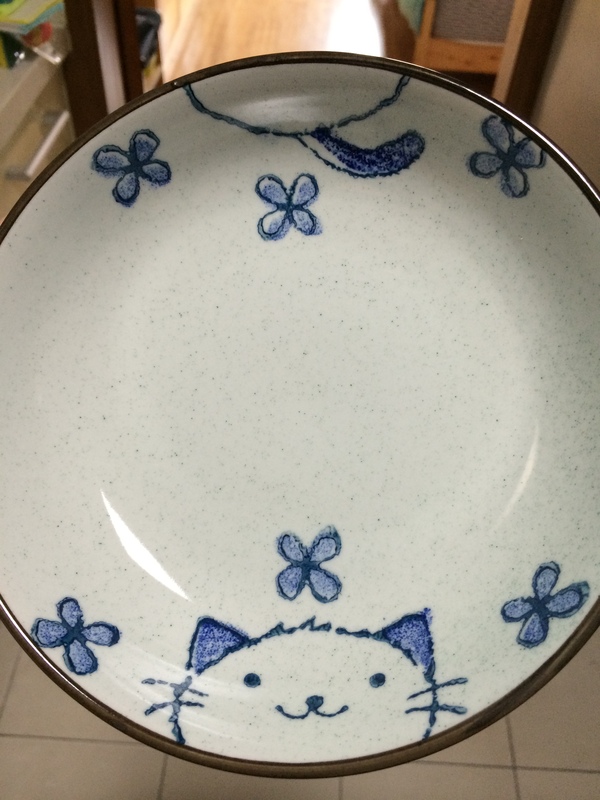 I also bought cat plates. Because, cat plates. Entering and exiting both Carrefour and Wal-Mart requires riding escalator ramps. You can even push your cart onto them and the wheels lock into place on the floor of the ramp. 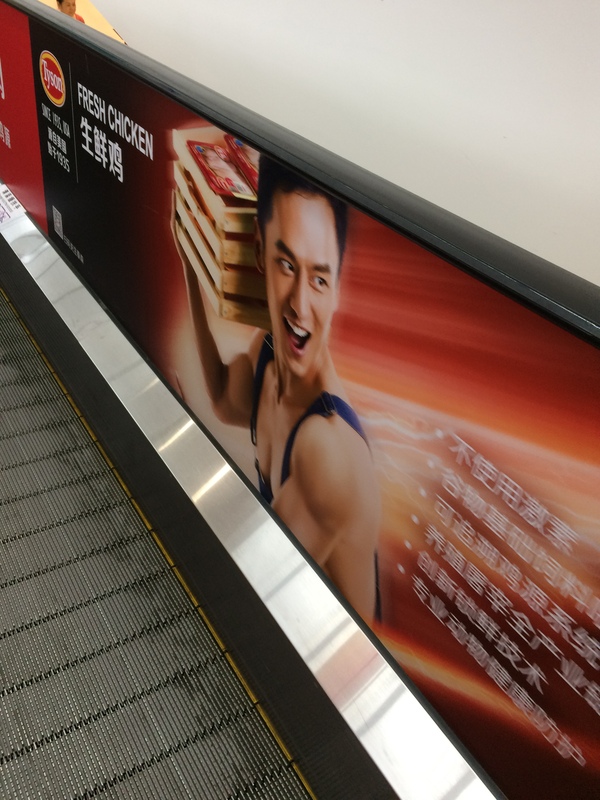 The most amusing part are these Tyson chicken adds, in which this guy is REALLY excited about chicken. It’s an adventure every time I go. 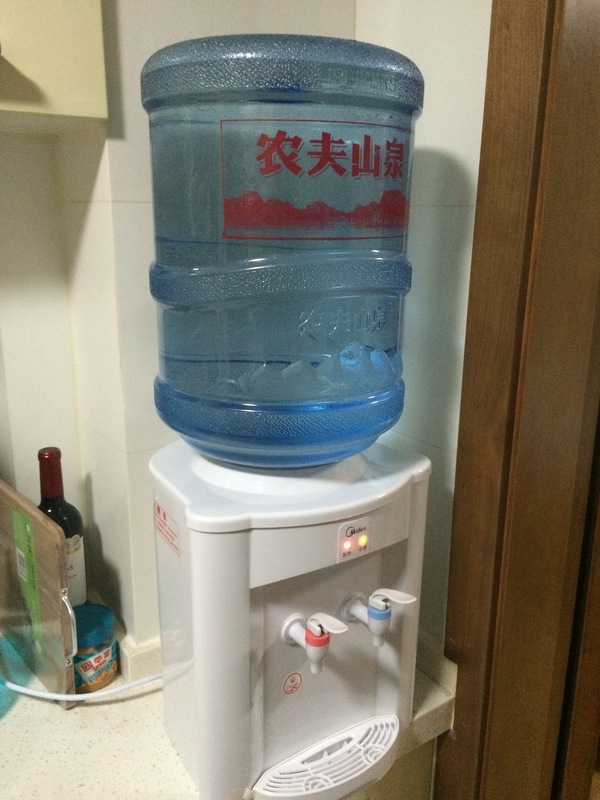 The last big thing about food here in China is safety. As I’ve mentioned a few times, the safety and cleanliness standards are a bit different here and so you need a healthy level of wariness to stay, well, healthy. The bonus with this is that it also gives you instant hot water—which is great for tea in the morning! I have an electric kettle but apparently sometimes I’m just too lazy to wait 2 minutes for the water to boil. Instant gratification for the win! Because the water isn’t drinkable, however, you have to be careful about vegetables and fruits too. Sometimes these foods have been washed in the tap water and now have harmful bacteria on them. Sometimes they’re just not kept in clean places. Either way, it’s good to be wary—some people suggest not eating anything unless it has a thick skin you can peel off. I haven’t stuck to this suggestion—mostly because my body hated me when I first got here and wasn’t eating enough fruit and veggies—and I just hope for the best. Everyone who I’ve met here says that street food is amazing and you have to try it. That said, “street food” means food made at a little cart on the side of the road and cleanliness is typically not a huge important factor. I have not yet been brave enough to try it but who knows. Adjusting to the food here in general has been interesting. There is a large amount of drinkable yogurt that you can find in most grocery and convenience stores, and I find that the yogurt helps stabilize my digestion. I’ve had some upset stomachs—and one particularly queasy experience that I do not care to recall—that my new best friend Pepto Bismol has come to the rescue during. The downside is that there is not a plethora of pharmaceutical drugs here like in the US (what I wouldn’t give to see a local Walgreens or CVS…). I’m not sure what will happen when my friend Pepto finally runs out…but I have my fingers crossed. So there you have it. That’s my 1.5 months experience with food in China. I am sure I will have many more stories and experiences to share in the coming months (good ones I hope!). Previous Comfort in the Uncomfortable Next Thanksgiving Day in the H.K. Hi Katie! Please keep your blog posts coming. I’m enjoying your updates. When needed, let me know and I’ll send you a case of Pepto! !